Orlando businesses of all types need an ADA ramp to facilitate access for those with mobility challenges. Orlando buildings of all sizes, shapes, and types need a high-quality and reliable ADA ramp. ADA is an acronym that stands for the Americans with Disabilities Act. This Act requires Orlando businesses and public facilities provide a means of access and exit for handicapped individuals. Consider all of those people who use wheelchairs, canes, crutches, and other mobility devices to move around. These individuals need an ADA ramp to access and exit your property with ease. Your Orlando ADA ramp will eventually pay for itself as more people will access your facility with this new entryway. It will reduce the foot traffic through the main steps, walkways, and doors. The ADA ramp will also make it that much easier for people to exit your facility in an orderly manner. The end result will be an uptick in customer satisfaction. Your facility needs an ADA ramp, regardless of whether you sell clothes, electronics, food, or anything else. Even Orlando schools, churches, libraries, and government buildings require an ADA ramp for equal access. Let ACPLM add an ADA ramp and people will be able to access your facility at all times regardless of their mobility limitations. We have installed countless ADA ramps throughout the state of Florida. 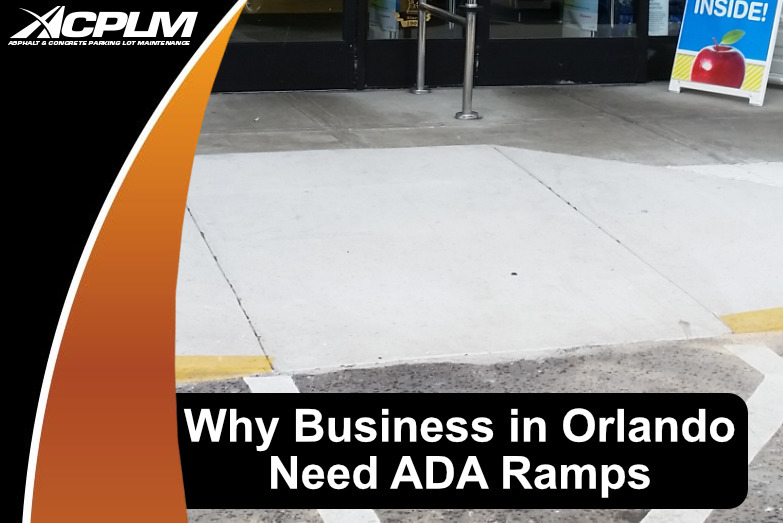 If your Orlando property requires an ADA ramp, work with our experts to get the job done right. We will install Orlando ADA ramps in exact accordance with the detailed ADA requirements. We will ensure the ramp slope ratio, handrails, and landings are the proper dimensions. As an example, the ADA rules mandate handrails on the sides can’t elevate more than 6”. This is just one of the many details we account for when installing your new Orlando ADA ramp. If your Orlando property does not have an ADA ramp, reach out to us to install one. We can also modify your existing Orlando ADA ramp and improve your parking lot in countless ways.